To celebrate the one hundredth birthday of Roald Dahl, The Rose Gallery have a number of brand new collector’s edition prints by Sir Quentin Blake. While stocks last on the prints, the fine art gallery are offering a free Roald Dahl book with every purchase from the range – all just in time for the release of the new BFG movie this July. Roald Dahl is possibly the most famous author that Quentin Blake has collaborated with. He helped bring to life his children’s books with illustrations. 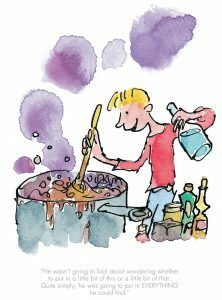 In 2012 Quentin Blake released a new series of limited edition collector’s prints taken from some of the most popular Roald Dahl stories – Matilda, the Twits, George’s Marvellous Medicine, the BFG, Danny Champion of the World and Charlie & the Chocolate Factory. Prices for the mounted artwork start at just £85 and make the perfect option as a birthday gift. With so many to choose from, the hardest part however is picking your favourite. For the upcoming Father’s Day, we recommend the Danny The Most Marvellous print which makes for a fitting present.